What do you remember about your early years at school? If you’re like me, chances are not too many of the specifics. But I am pretty sure that my oldest son, now in the second grade, had one of those lessons last week. Why do I say that? Because I have a very similar memory from my time at school, as does my mother. More than 60 years separate these lessons, but they are essential the same. And the lesson? Dissecting an eyeball and extracting the lens. My mother worked on a sheep’s eye. I dissected a cow’s eye. And my son got to do the same with an anchovy. It was amazing watching a class full of normally twitchy seven and eight year olds settle down and learn what makes a fish a fish. The climax was removing the lens and feeling the tiny hard sphere that you could then take back to class. It made science-education real — if a little smelly! 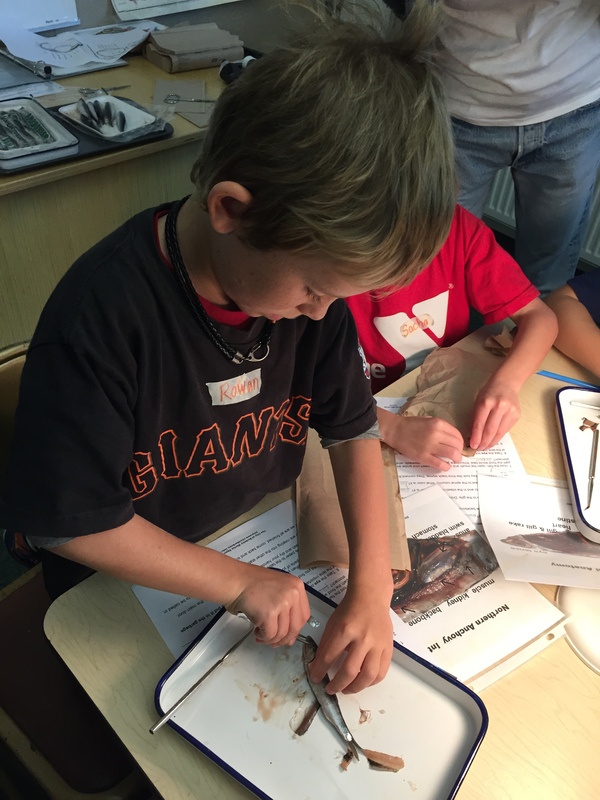 The staff and many volunteers at the Shorebird Nature Center at the Berkeley Marina did a great job turning these students into scientists for the morning. I have a hunch that one of his early school memories will be of this day and that little anchovy. Do you have a favorite lesson that has stuck with you through the years? Previous PostRemembering Martin Litton’s passionate and indomitable spiritNext PostIt’s a small flood!